When Josh is away, Nick and Jennifer take the reins of the SV411 Podcast. On this week’s episode, we discuss the incident involving a Campbell police officer who held two drivers at gunpoint in Hollister; the fractious Milpitas City Council; the plan to rebuild the San Jose Light Tower and give the Capital of Silicon Valley the landmark it deserves; and go over a few items to check out this weekend. SHHHH: Peter Thiel used his deep pockets to put Gawker out of business. Who’s next? The news is absolutely insane these days. Like. Every. Single. Day. And yet, the media suffers—from declining ad revenues, for one, and also from a sustained attack from 1600 Pennsylvania Ave. But Donald Trump isn’t the only billionaire (ahem… “billionaire?”) using his status to undermine news organizations with which he disagrees. FOSTER THE PEEPS: Heinz Jones, co-owner for Forager, believes the South Bay beer and culinary scene is prime for expansion. Photo by Greg Ramar. Silicon Valley Beer Week is back for the fifth year. Josh and Nick discuss the science of sour brew, the SVBW kickoff party at Forager Tasting Room + Eatery and many more events all over the South Bay. All this, plus a conversation with local artist and musician Ben Henderson. He is responsible for a great deal of the downtown San Jose aesthetic and will be opening up for Blues Traveler at Music in the Park. NIX THAT: Nathan Hill’s new novel presaged Trump. Writers are absolutely necessary in the age or Trump. That’s the focus of this week’s Metro cover story, a profile of Nathan Hill, author of the groundbreaking novel The Nix. SV411 EP007 2017 Is This Opera? HIP-HOPERA: Alexandra Sessler and Carlos Aguirre are working with Opera Cultura to achieve a new vision of what the art form might be. Josh and Nick discuss a new book by Stanford law professor Mugambe Jouet about the legacy of the idea of American exceptionalism, as well as this week’s “I Saw You” about an apparently racist tech bro. Plus, this week’s cover story: About a number of local arts organizations attempting to change the way people think about opera. FUNNYMAN: Comedy Sportz founder Jeff Kramer celebrates 30 years of competitive comedy. The Fourth of July holiday is nearly upon us. The SV 411 podcast celebrates the annual freedom hoedown spectacular by welcoming columnist Gary Singh to the program. Josh and Nick discuss this weekend’s ID10T Festival, organized by comedian and king of the nerds, Chris Hardwick. Also: “Brotopia”—how Silicon Valley’s tech elite plan to live forever. GOOD COP: Josh talks with SJPD Chief Eddie Garcia in this week’s podcast. 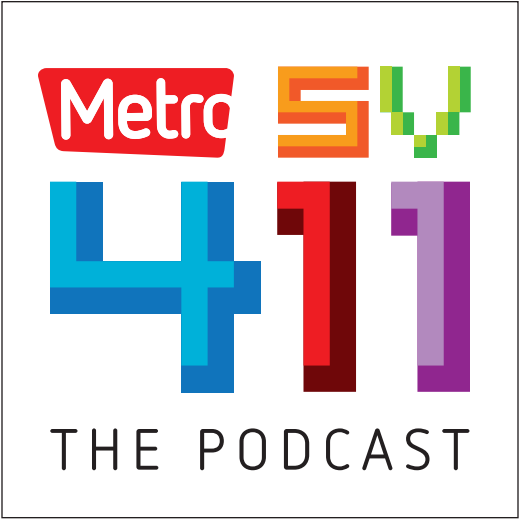 The SV411 podcast is heating up just in time for summer, which is to say Metro editors Josh Koehn and Nick Veronin talked themselves into heat stroke.